Wholesome homemade baked beans are surprisingly easy to make and really hit the spot when you want something simple but special. Begin the night before by soaking the beans in cold water. The following day, cook according to pack instructions, then drain well. Heat a large pan and add the bacon. Fry for 1 minute, then add the onion, celery and garlic and continue to fry for 4-5 minutes until the bacon is cooked and the onion has started to soften. Stir in the chopped tomatoes, black treacle and tomato purée. Bring to a simmer, then stir in the cooked beans. Return to the boil and simmer for about 10 minutes. Toast the bread and spread with olive spread. Stir the chopped parsley into the beans, then spoon over the toast and serve immediately. 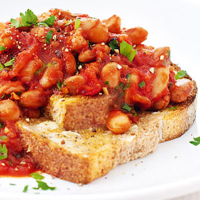 Try using other beans such as haricot, cannellini or black eyed beans, or to save time use canned varieties. Perfect for serving on jacket sweet potatoes, topped with grated mature Cheddar.